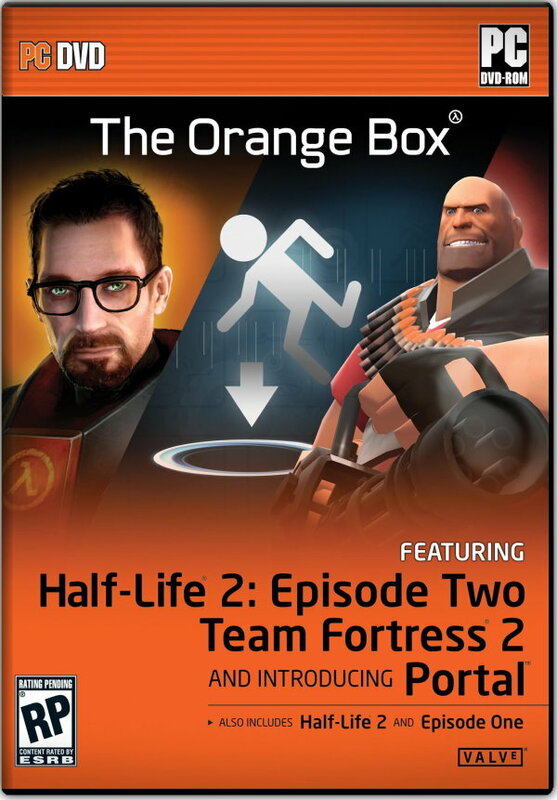 Portal is probably the greatest thing about The Orange Box. It's a clever mix that combines first-person action with very focused puzzle-solving. It's also completely hilarious. The premise is simple. You're a woman who wakes up in a tiny box inside some lab facility run by a mysterious company called Aperture Science. You're presented with a portal that lets you walk out of the room and into another. From there, the game gradually introduces you to portals and eventually gives you a gun that you can use to fire portals onto walls, ceilings, and floors. Your primary and alternate fire buttons are used to create blue and orange portals, respectively, and walking, jumping, or falling into one portal sends you out of the other one. You can also pick up objects, such as large boxes, which often must be placed on large buttons to open doors so you can proceed through a variety of test chambers. Along the way, a computerized female voice guides you...and misguides you. The dialogue from the computer supervising your test gets more and more overtly funny as you play and leads to a very satisfying conclusion, including what might be the best end-credit song ever written. Later puzzles force you to pull off some tricky portal maneuvers and require you to consider how much momentum you have when you enter a portal, given that the same momentum is carried with you when you come out the other side. So if you jump down into a floor portal and have the exit portal set on a side wall, you'll rocket out of that portal with the velocity you had when falling into the hole on the floor. 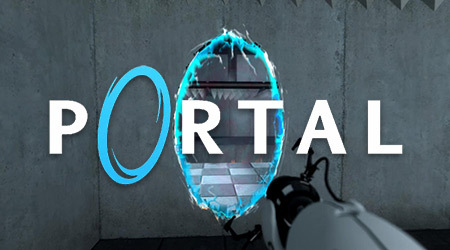 Upon finishing Portal, which may take you three hours or so if you're able to quickly grasp the concepts that are presented, you'll unlock a series of advanced challenges. These include six harder versions of puzzles from the main game, and challenges that ask you to finish levels under certain limits, such as the time it takes you to complete the level, the number of portals you use, or the number of steps you take. The advanced puzzles are tough, but not impossible. However, the challenges are much rougher. There are bronze, silver, and gold medals awarded for each of the three challenge types across six levels. Even after you've figured out the puzzles, Portal remains fun and is worth coming back to again and again, just to listen to the dialogue and spend a few fleeting moments with the weighted companion cube. It's a shame that it had to end this way. "Team Fortress® 2 (TF2) is the sequel to the game that put class-based, multiplayer team warfare on the map. This year&#8217;s most anticipated online action game, TF2 delivers new gametypes, a signature art style powered by Valve&#8217;s next generation animation technology, persistent player statistics, and more. Unlike other &#8220;class-based&#8221; games that offer a variety of combat classes only, Team Fortress 2 packs a wild variety of classes which provide a broad range of tactical abilities and personalities, and lend themselves to a variety of player skills. TF2 features the most advanced graphics of any Source-based game released to date &#8211; and the most exciting class-based action ever created."